This Is the first time that Prabhas has shot for a magazine cover. In 2015, Telugu superstar Prabhas became a national Heartthrob when his highly ambitious ‘Baahubali 2’ opened to a phenomenal response at the box office and received rave reviews along the way. In it, he essayed a double role and gave strong proof of his versatility as a performer. Nearly two years later, Prabhas mania gripped the nation once again when ‘Baahubali 2’ opened to a phenomenal response at the ticket window and redefined the very tenets of cinema. An SS Rajamouli directorial, it grabbed plenty of attention courtesy its visual appeal and Prabhas’ crackling chemistry with his onscreen lady love Anushka Shetty. Praising the ‘Baahubali’ juggernaut. Deepika Padukone had said that it did a terrific job of breaking regional barriers. Now, there is some awesome news for Prabhas’ die-hard fans. In an exciting development, he recently graced the cover of a leading magazine and made quite an impact. Sporting a 3 piece suit and a tie, T-town’s ‘Rebel’ looked like a complete gentleman and seemed to be a complete gentleman. His charming expressions gelled quite well with his prim and proper look, upping its recall value in a big way. That’s how you make an impact. On a related note, Prabhas is currently shooting for ‘Saaho’. The film is an action-thriller and is being directed by Sujeeth. Its first look—which was released on Darling’s birthday—featured Prabhas in a stylish new avatar and created a buzz amongst fans for all the right reasons. Besides him, ‘Saaho’ also features Bollywood stars Neil Nitin Mukesh and Shraddha Kapoor in the lead roles. Sometime ago, the ‘Prem Ratan Dhan Payo’ star had said that he will be playing a mega-villain in ‘Saaho’. He in a separate interview with a leading daily, he had praised Prabhas’ dedication and said that he is a humble person. “To dedicate five years of the prime time of your career in doing something that you believe in and that also at a young age is a big deal. I bet no other actor would have done it. He started off so brilliantly and it paid him off because his believed in it and worked hard for it. That answers a lot about Prabhas as a person,” he had added. As far as Shraddha is concerned, she will be romancing Prabhas in what happens to be the first South film of her career. Sometime ago, Prabhas had said that she has a crucial role in the film and not just a fleeting appearance. “I have never worked with a Bollywood actor before and she is the best choice for the role. We are very lucky to have her on board. Her character is not just like coming and going or just there for the songs. The character is very important and adds a lot of weight to the story. It is one of the most important characters in the film. She has some amazing action sequences also. It is a very strong character,” he had told a leading news agency. Interesting the ‘Saaho’ team will soon be leaving for the Gulf and shooting some high octane scenes there. Prabhas has undergone some special training for the same. 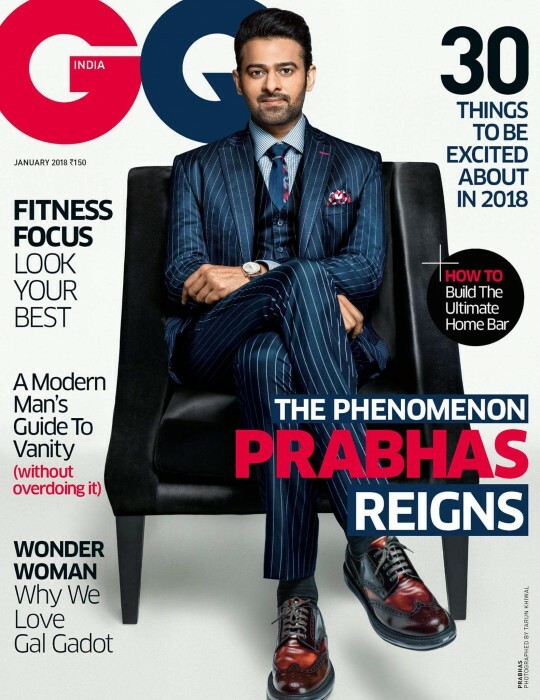 So, did you like Prabhas’ look on the magazine cover? Talk to us in the space below. Something is missing. bad editing. he is not looking good. looking very thin. not good.